Providing an authentic answer to such a question is complicated by two general facts about Australia. Firstly, Australia occupies an entire continent, similar in size to the USA, with a great diversity of climates and geographical features. Secondly, a large proportion of the population are either immigrants or are descended from persons who migrated here less than 100 years ago; there has been little time to develop national or even regional culinary traditions. There is, however, one method of cooking which is common to all parts of Australia, even if to varying extents according to climate: barbecuing on a grill, over flame or radiated heat, mostly outdoors but occasionally indoors, eg restaurants. In so doing, we have built on one of the main cooking methods of the original inhabitants and incorporated the preferred ingredients and flavours of each wave of immigrants. We have recently entered the summer period in Australia. In Melbourne, this was preceded by an extended winter, so Maggie and I are making up for lost time by using our Weber Q barbecue to prepare the centrepiece of most of our main meals. And this season, we have set out to apply new flavours and methods to some of our favourite cuts of meat. Here are three of the new items on our char-grilling menu, tested and modified to the point of complete dining pleasure. Bought from a reputable butcher, this cut of beef has good flavour and, if given a good rest after it is cooked, won’t be too chewy. 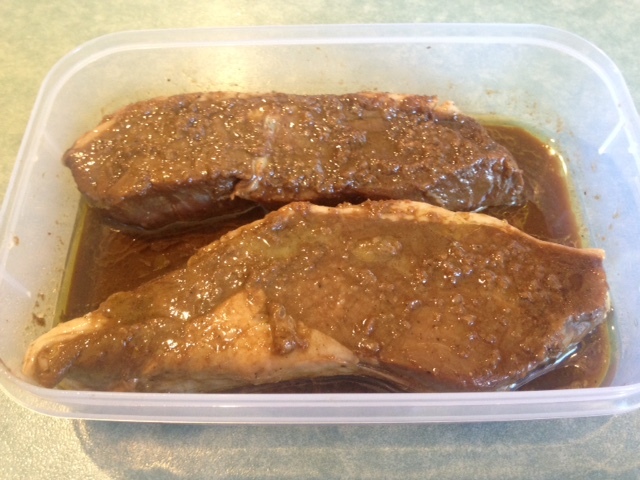 Beef rump steaks also cope quite well with being marinated. You can find the recipe that we took as our starting point here. 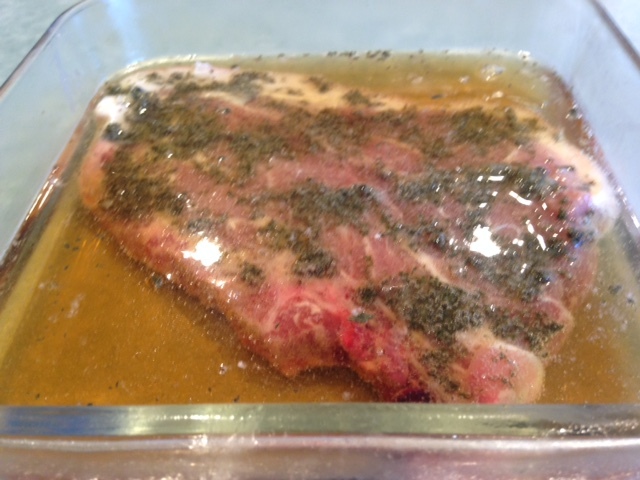 Marinade the meat overnight and turn it in the morning. 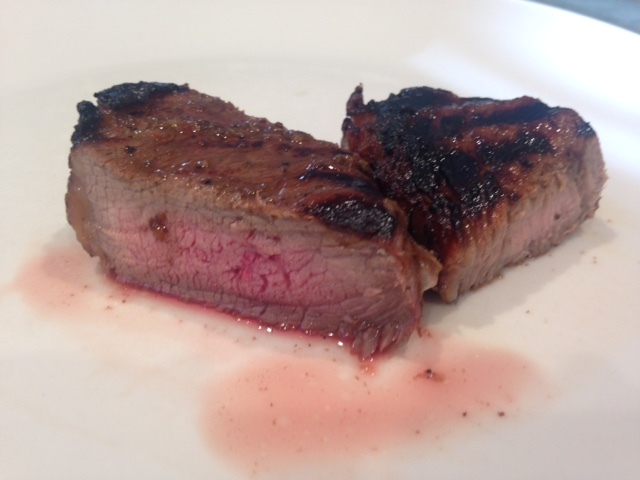 The balsamic vinegar helps to produce a good char on the meat but some people could find it a little too sweet; use just 10ml if that is the case. And you might feel that the soy sauce makes the end result a little too salty; again, use just 10ml. 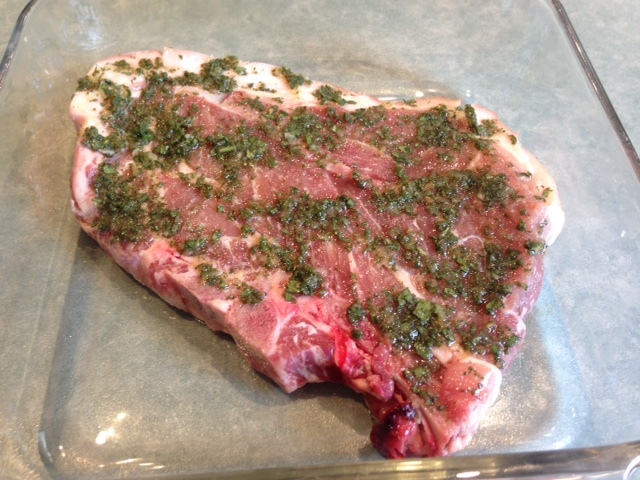 As Martha Stewart alludes in her recipe, pork shoulder chops are suitable for chargrilling because there is more marbling in their meat. So, they don’t dry out too much. 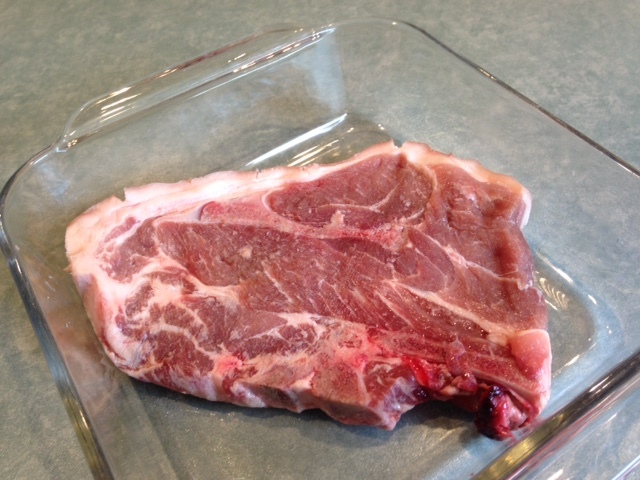 A pork loin chop, say, would become tough to eat when barbecued; not very wise when your teeth are as old as mine! We have made some modifications to the original recipe and dispensed with the barbecue sauce element altogether. We find that one large pork shoulder chop has enough meat for the two of us; we fill out the meal with such side dishes as a Waldorf salad or a fresh fennel and orange salad. 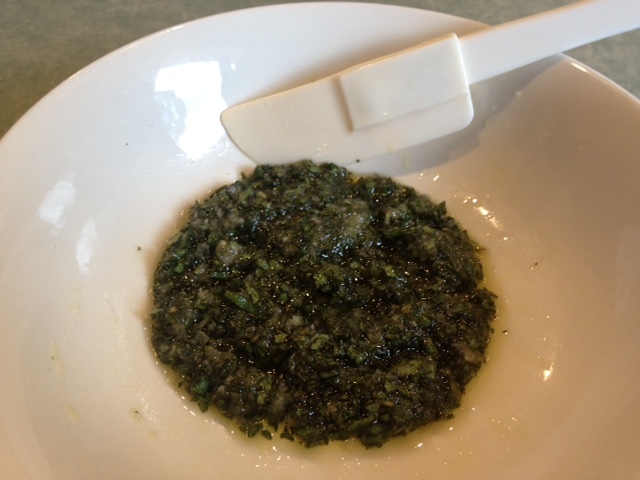 For that one chop, we slash the rind at 3cm intervals, to help reduce curling during the grilling process, and make the marinade paste from: 12 fresh sage leaves, shredded; 2-3 cloves of garlic, grated or crushed; 1 tsp salt; and 1 tsp olive oil. As instructed by Martha, we cover the chop with an everyday beer – no need to go boutique for this job – an hour before cooking the chop. 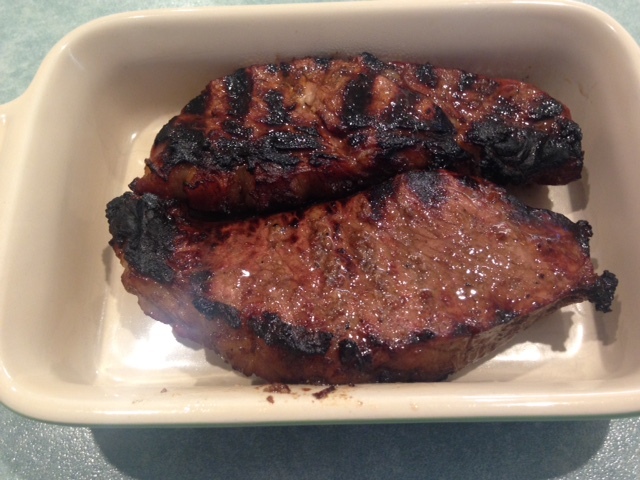 Once the grill is very hot, we cook the drained chop on one side for 8 minutes, then flip it and cook for a further 7 minutes. The end result is juicy and delicious. The third recipe in our current repertoire of cooking in an Australian style was actually created by a local chef, leading chef/restaurateur Neil Perry. You can read the original recipe here. We have modified the cooking method too. 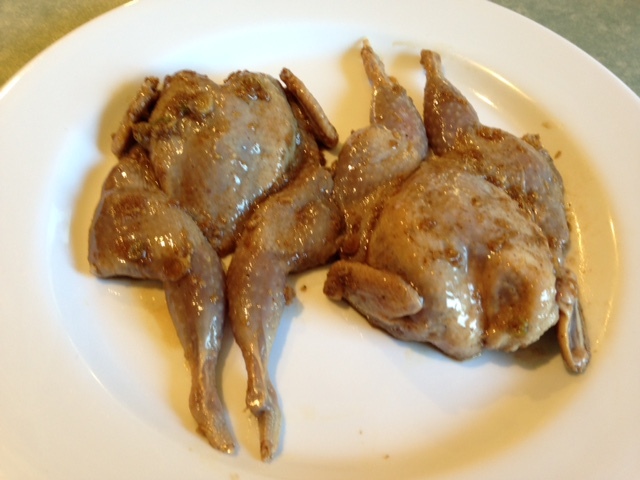 We prefer to cook the quail for 4 minutes skin-side up, 3 mins skin-side down, then a further 1 min skin-side up. In our Weber Q, this sequence ensures that the skin becomes attractively charred, with minimal loss of skin from sticking to the grill. 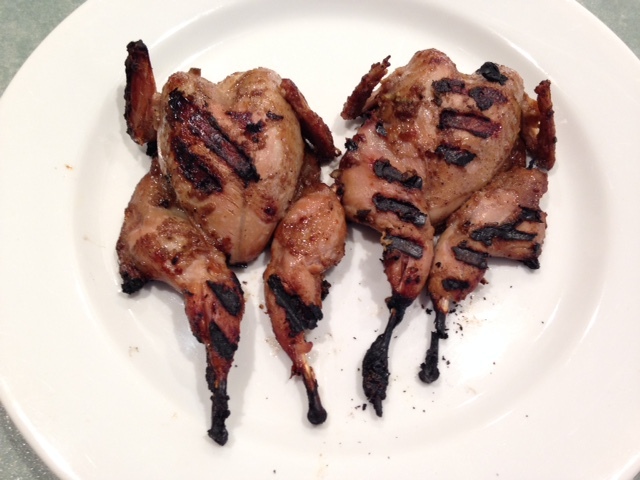 Quail isn’t everyone’s idea of an appealing food – it can be fiddly to get at the meat and it has a gamey flavour. However, we enjoy it on a regular basis and this recipe produces a delicious result during Australia’s barbecue season. 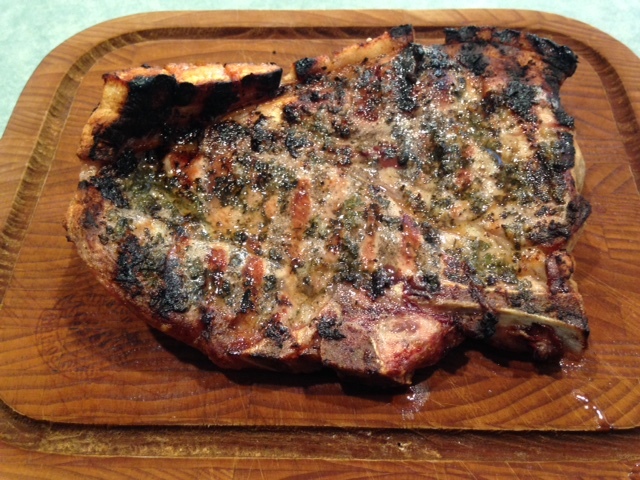 This entry was posted in Cooking and tagged Australian food, chargrilled pork, chargrilled quail, chargrilled steak, chargrilling, marinades, pork shoulder chop, Quail recipes, rump steak. Bookmark the permalink.